For those people whose joining dates were delayed or joining completely canceled when Indian IT faced a slow down due to collapse of US financial sector here is good news. Here is an opportunity to make yourself part of TCS, of course there will be better compensation/brand recognition as compared to current roles you are in. With the markets picking up again, after resurrection of US economy and subsequently major outsourcing clients, we can see better times ahead. Tata Consultancy Services (TCS) is India’s first IT Consulting and Services organization. TCS helped lay the foundation for the growth of the industry in India with pioneering initiatives and business models. 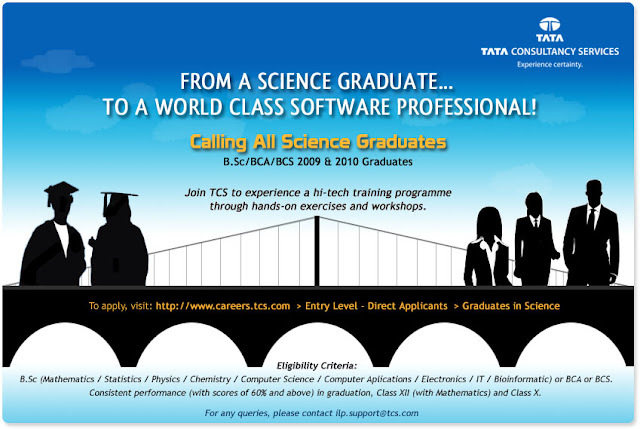 TCS has also played a seminal role in the global acceptance of Indian software. We are the world’s first organization to achieve an Enterprise-wide Maturity Level 5 on both CMMI® & P-CMM®. TCS is the ‘Best Employer in the IT sector’ (Dataquest-IDC Survey 2004 & 2005) and has been awarded the ‘Best Employer in India for 2004′ (Hewitt Associates and CNBC TV 18). At TCS, it means achieving real business results that allow you to transform, and not just maintain, your operations. Our IT services, business solutions, and outsourcing bring you a level of certainty that no other competitor can match. You'll experience requirements that are met on-time, within budget, and with high quality; greater efficiency and responsiveness to your business; and the ability to shift investment to strategic initiatives rather than tactical functions. You can go to http://www.recruitment.tcs.com/ and apply.. There you can upload your CV and your current remunerations, your skill sets and relevant work experience.